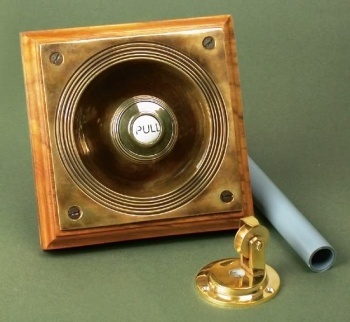 Our solid brass Claverley bell pull is mounted on a hardwood backplate, complete with crackled, porcelain ‘PULL’ disc. Components are in solid cast brass, the spring in tempered steel (as the orginals were). 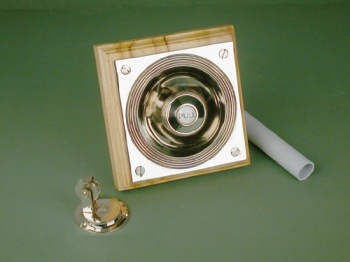 Available in aged brass or aged nickel finish. Designed for quick and easy installation. Dish sits ‘inside’ wooden back plate to eliminate the need to chase-out brickwork. All fixings, blanking pulley, screws, rawplugs and fitting instructions are included in the pack. Extra pulleys if needed can be provided at additional cost. We recommend an additional pulley for each 5 feet of distance you need to go. Dimensions - Height 157mm, Width 157mm. Projection when fitted (including wooden back plate) 57mm. Projection into brickwork 132mm.Blanking pulley. Fits internally, directly opposite pulley on rod pull. 60mm (W). Projection 50mm. The compliment the bell pulls there are two internal bells the flower and lady design which are available as seperate items. Lovely quality item - speedy delivery and very well packaged. Many thanks Anthony for your feedback on the Claverley Bell Pull. 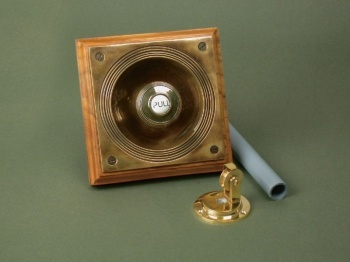 Something a little different than your standard electric bell push. It has a very Downtown Abbey appeal.